This is just a small sample of the Great Foods that We offer. Please call or better yet come on down to the Ranch and see for yourself what we can tickle your tastes buds with. tater tots with nacho cheese and shredded Colby jack cheese topped with bacon bits and diced tomato's. Your choice of Chicken, Pork or Brisket Smoked in House for 12 to 16 hrs, shredded. topped with nacho cheese, bbq sauce, and sour cream. Diced chicken, bacon, red onion, tomato and shredded cheese in a grilled flour tortilla. served with ranch dressing. Filled with taco meat or bacon and topped with cheese, diced tomatos, and green onions. Served with sour cream. Delicious deep fried dill pickle chips with ranch. 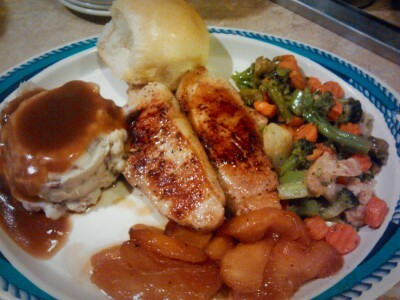 8oz Center cut boneless pork loin, perfectly grilled, juicy and tender. 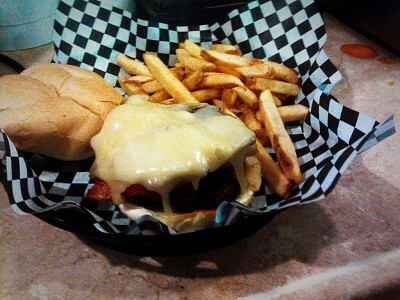 10 oz Grilled Chicken breast topped with bacon, tomato, green onion, and melted colby jack cheese. Hand cut 12 oz RIBEYE, grilled to your liking. served Hot and Happy. Alaskan amber beer battered cod, shrimp and clam strips. served with fresh coleslaw. 6oz portion of our own hand battered catfish filets that include hushpuppies. Topped with peper jack cheese, onion tanglers, lettuce, tomato and House made buffalo sauce. Sliced Turkey, bacon and chedder cheese all melted on your choice of bread. Grilled chicken, cucumbers, bacon, red onion, colby jack cheese, diced tomatoes, lettuce, avocado and southwest dressing. Topped with green chilies, bacon, pepper jack cheese, avocado, lettuce, tomato, and a chipotle mayo.